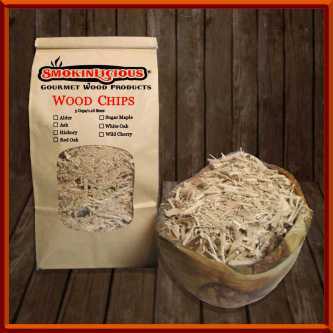 Our 'Grande Sapore' Wood Chips are ideal sizing for the gas/LP grill, charcoal grill, as well as the electric smoker models (Be sure to consider our Smokin' Dust for electric smokers as well). Grilling manufacturers have recognized the benefits of smoking foods by incorporating smoking drawers into their grilling equipment. These drawers are designed to hold pre-soaked wood chips which when heated, impart a smokey flavour to any food item: meats, poultry, fish, vegetables, fruits, herbs, spices, etc. But even for the grilling enthusiast who doesn't own a wood chips drawer, smoking foods with wood chips is as easy as folding a piece of aluminum foil (see SmokinLicious FAQ's to learn how to make your own foil pouch) or using a disposable foil pan or pre-purchased smoker chip box. Before using wood chips in a gas/LP grill,soak them for a minimum of 15 minutes in water, juice, whiskey, beer, wine, or other liquid. Allow the chips to drip dry for a few minutes prior to adding them to a smoking drawer or foil pouch/pan/box. When cooking with a wood/charcoal smoker, simply add the chips directly onto the existing wood or charcoal - no need to pre-soak. Our wood chips contain 100% bark free forest grown woods of Wild Cherry, Red Oak, Hickory, Beech, White Oak, Sugar Maple, Ash, and Alder. The key to adding flavour to meats, poultry and fish is to use quality hardwoods. 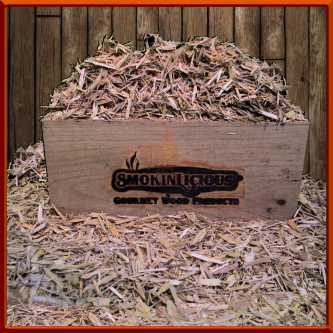 At SmokinLicious, we only provide the heartwood of hardwoods, meaning our products are always free of resin, mold spores, and sapwood. Plus, we use woods that only provide a mellow to moderate flavouring, thereby controlling the tendency to overpower the food. Please visit our Products Section for a complete listing of related items.